Tolland County Mutual Aid Fire Service remembers Ashford Fire Department Chief Bruce Fletcher. On November 18, 2002, the Ashford Fire Department lost one of their own in the Line of Duty after responding to a medical call. Chief Fletcher felt ill while completing paperwork at the firehouse. Chief Fletcher summoned for help and was transported to Windham County Memorial Hospital where he passed away. Chief Fletcher is remembered for his dedication to family and friends and his love for firefighting and hunting. Chief Fletcher joined the department on November 12, 1972 and worked his way up the ranks to become Chief in 1996. He had a bachelor's degree in fire science and certification as an EMT, a Connecticut State Fire Officer 2, and was involved in training at the Connecticut State Fire Academy. Chief Fletcher was also a decorated U.S. Army veteran of Vietnam and received the Bronze Star medal and two Purple Hearts. He served in the Connecticut National Guard for 20 years. 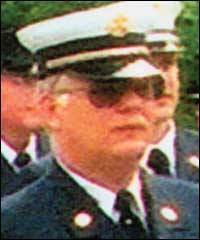 Chief Fletcher had just retired from his job at DCMA Pratt & Whitney in October one month prior to his death. Photos is courtesy of National Fallen Firefighters Foundation.